Create Desktop Shortcut to Auto Shutdown Computer easily in just in one Click on the Desktop Shortcut. You can Create Desktop Shortcut to Shutdown your Computer in normal mode and can also create a Shutdown Shortcut to Shutdown in force or Brute. Easily Create Desktop Shortcut to Shutdown Computer with Easy Shutdown Software Utility. Download & Install Easy Shutdown on your Computer or Laptop and Crete Desktop Shortcuts to Shutdown Computer or Shutdown Computer (Brute). You can easily create Desktop Shortcut to Shutdown Computer or Laptop easily with Easy Shutdown Utility on Windows XP, Windows Vista, and Windows 7. 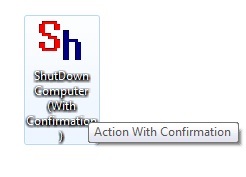 Create Desktop Shortcut to Shutdown Computer Quickly in on Click with Easy Shutdown Software.